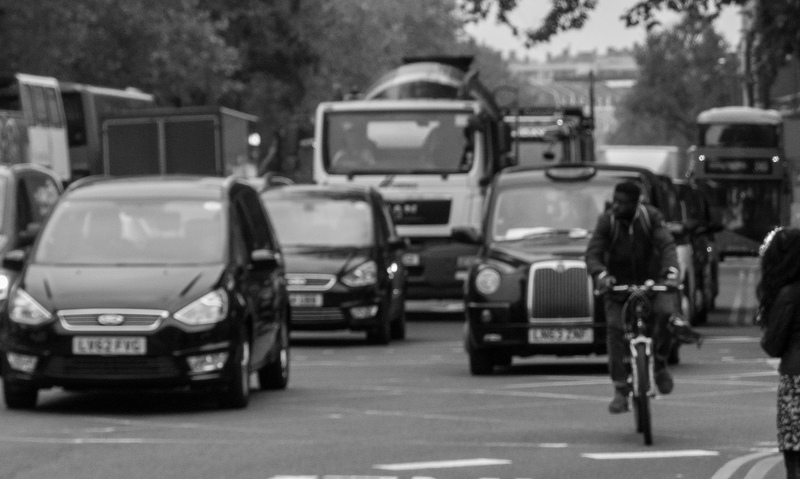 What can the next mayor do to tackle London’s hazardous air pollution? If news emerged that a virus was killing thousands of vulnerable Londoners every year then there would justifiably be public alarm, followed by swift political action. Yet the impacts of this imaginary scenario are similar to what air pollution has been inflicting on Londoners for many years, while the political response has been slow. 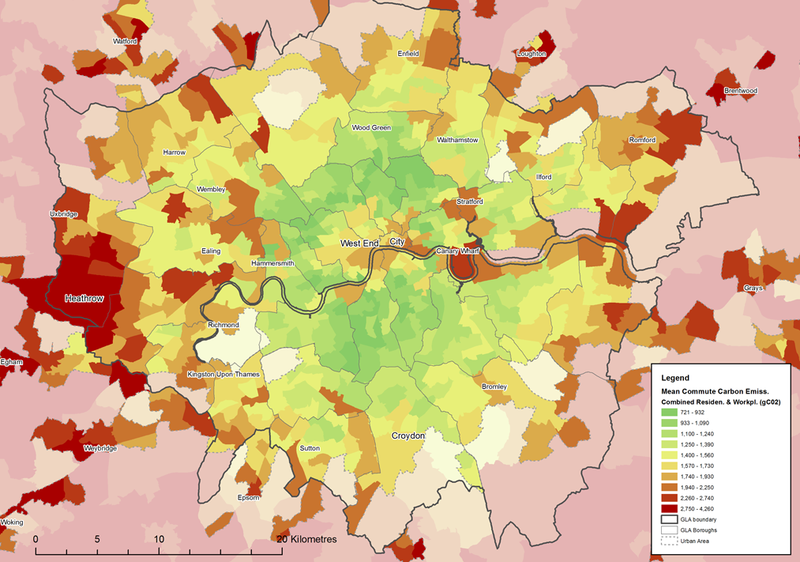 According to the most up-to-date and comprehensive research, air pollution reduces Londoners’ life expectancy equivalent to the death of 9,400 people of average age every year (5,900 due to NO2 and 3,500 due to PM2.5) as well as exacerbating respiratory diseases in vulnerable populations. Despite the severity of these impacts, it has become standard practice over the last decade for national government and the London Mayor to gloss-over the problem, downplay continued breaches of European law, and for politicians to delay taking any significant responses. The current London mayor, Boris Johnson, has been slow to face up to the challenge. His tenure began by removing the western extension to the Congestion Charging Zone, thus increasing vehicle numbers in Inner West London, and opting out of using the Congestion Charge to tax the most polluting vehicles. This would have boosted the adoption of hybrid and electric vehicles (still only a meagre 1% of new cars) and reduced heavy emitters in Central London. Furthermore Johnson has not succeeded in comprehensively upgrading London’s bus and taxi fleet to hybrid and electric vehicles, instead embarking on an expensive new Routemaster project which still produces substantial emissions and currently makes up a minority of the overwhelmingly diesel bus fleet. 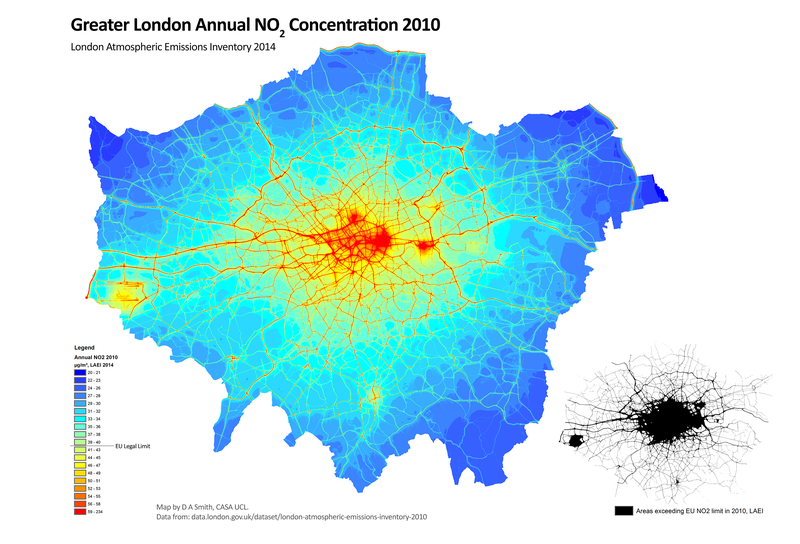 NO2 Annual concentration in London 2010, modelled by the London Atmospheric Emissions Inventory. All of Inner London and many major roads in Outer London greatly exceed the EU limit. As recently as 2014, Johnson was still playing down the air pollution problem, in the face of strong evidence of London’s busiest streets like Oxford Street having amongst the highest concentrations of nitrogen dioxide in the world. For much of his time as mayor, he has assumed that the issue is not a public priority, and that driver and transport demands trump health concerns. This approach looks more questionable by the day. Evidence continues to mount that air quality is comparable in its health impacts to passive smoking and obesity. The consequences of the current Volkswagen scandal are still emerging as the huge gap between the advertised environmental performance of diesel vehicles and what we are really breathing in our cities is revealed. And the full costs of poor air quality are only beginning to be counted (e.g. billions of pounds added to NHS bills). Looking to the future, London must now tackle the air pollution problem with a new mayor in the upcoming 2016 elections. The scope for change looks positive, as the main candidates on both the left and right have been openly discussing the need for change. What then could a new mayor do to address air quality and improve the health of Londoners? To be fair to Boris Johnson, he did finally respond to pressure and announce a significant air pollution policy in 2013, dubbed the ‘Ultra-Low Emissions Zone‘. The ULEZ is set to come into effect in 2020 and essentially uses the Congestion Charging infrastructure to tackle the most polluting vehicles (similar to what Livingstone proposed way back in 2006). The question is whether the ULEZ goes far enough. It’s based on Euro emission standards, which measure NO2 and PM10/2.5 as well as CO2 emissions. It correctly targets diesel vehicles, requiring them to meet the Euro 6 standard, which only came into force in September 2015, so almost all current diesels on the road would have to change or pay the charge. This means that the main source of NO2 emissions will be appropriately targeted. 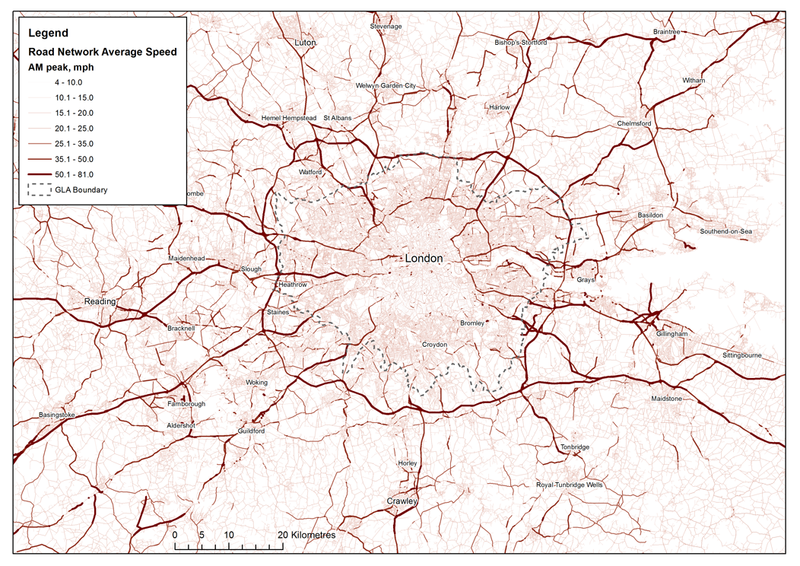 The current Congestion Charge boundary will be the basis of the Ultra Low Emissions Zone (map by TfL). There are limitations however. The charge is only going to be £11.50 (except for large buses and HGVs), so it likely many diesel users will continue to drive into Central London and pay the charge. Furthermore the ULEZ will only affect Central London; the rules on diesel taxis and private hire vehicles have not been decided; and ULEZ zone residents get an overly generous exemption until 2023. The next mayor will have a number of options that could be pursued if they want to be bolder than Johnson’s ULEZ proposal. These include increasing the ULEZ charge and/or Congestion Charge, bringing the ULEZ implementation forward to an earlier date, and potentially reintroducing the Congestion Charge Western Extension. All of these would make significant improvements to air quality, but would be controversial with drivers, many of whom were mis-sold diesel vehicles in the past as a supposedly environmentally benign option. The mayor may also want to re-examine the wider Low Emission Zone (LEZ) that tackles very polluting vehicles entering the whole of Greater London, as this affects the entire city and has not changed since 2012. Euston Road, one of London’s busiest and most polluted routes with NO2 annual concentrations typically twice the EU limit (photo by D Smith). A more radical approach currently being proposed for Paris is to ban diesel cars all together. This would certainly make a huge improvement to air quality. The problem for London would be that the city’s bus and taxi fleet would fail this restriction, and there would likely be a backlash from thousands of car and van drivers. This would be a very confrontational approach for a new mayor. The more pragmatic solution for London would be to work with the ULEZ framework, considering stricter measures and higher charges, and implementing the policy earlier. One very important issue for the new mayor is emerging from the current Volkswagen emissions scandal. It looks like the latest Euro 6 diesels produce significantly higher NO2 emissions in real world driving conditions compared to the misleading testing conditions. If this is the case then the proposed ULEZ will be much less effective in improving air quality (as Euro 6 diesels will be exempt from the charge). The ULEZ may have to charge all diesel vehicles, regardless of their Euro rating. This decision would need to made very early, so that there is sufficient time for car users to adjust behaviours accordingly. Oxford Street is London’s busiest pedestrian street and has some of the worst NO2 pollution in Europe. A response that is gaining popularity is to pedestrianise the whole street. Certainly this would be an iconic change to both the image of London, and to the experience of the city for thousands of Londoners and tourists. The challenge for this measure is avoiding creating bus jams at either end of Oxford Street, and handling the extra demand levels that would be placed on the already congested Central Line. These challenges are not necessarily permanent however, as the arrival of Crossrail in 2018 (which follows the west to east Central Line route through Inner London) has been described as a ‘game changer’ that makes pedestrianising Oxford Street a realistic option. The new mayor should certainly pursue this possibility. The wider challenge for the mayor is not to just think about Oxford Street, but to accelerate the upgrading of the entire bus and taxi fleet towards zero emission vehicles and develop wider pedestrianisation policies. This would improve air quality for all of London’s high streets. London is still at the trial stage of pure electric double-decker buses, which represents disappointingly slow progress considering how long we have known about air pollution problems. There’s been better progress on electric/hydrogen single-deckers. Considerable investment will be needed to upgrade the bus fleet, with decision-making based on real evidence and value-for-money. Johnson’s Routemaster project has failed both these criteria, and better leadership is now required. All the main candidates for the London Mayor oppose the expansion of Heathrow, with air pollution alongside noise pollution amongst the most important factors. You can see how Heathrow already dramatically increases emissions in West London in the NO2 annual concentration map at the top of this article using the London Atmospheric Emissions Inventory data. This is due both to emissions for aircraft engines, and the thousands of cars driving to and from Heathrow everyday. The challenge will be how effectively the new mayor can challenge the UK government to reject the Heathrow expansion option. Overall, the issue of air pollution has gained unprecedented prominence as we approach the 2016 mayoral elections. The main candidates need to respond accordingly in their manifesto commitments, with London having a lot of catching up to do after eight years of little change. It will be interesting to see which candidates are prepared to be bolder. Cities that achieve social and economic success without high car use generally have three things in common: high densities, good urban design, and successful planning frameworks that integrate land-use with public transport, walking and cycling networks. 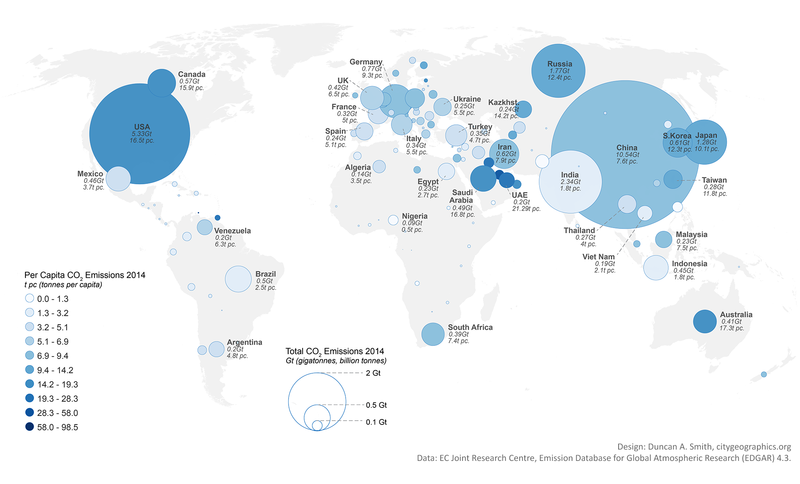 I’ve been working on an LSE Cities project that investigated two leading global cities in green transport- Copenhagen and Hong Kong- to better understand how their leading positions were reached. You can read the final Going Green report here. 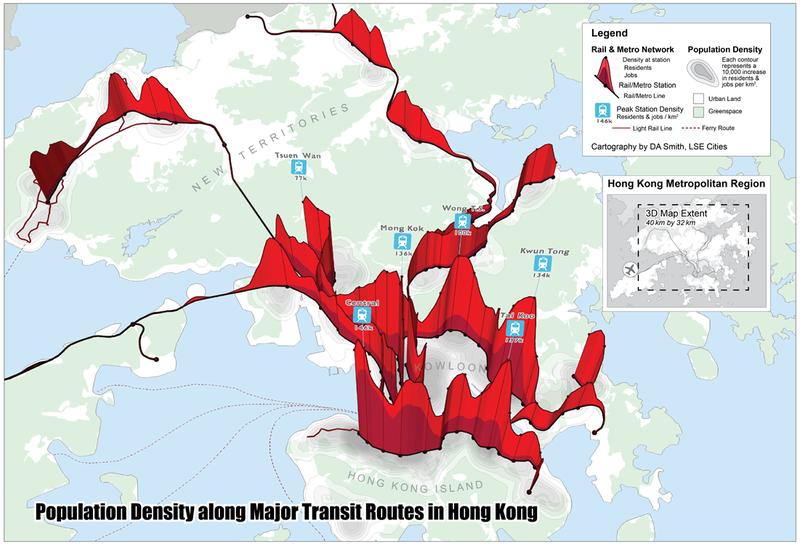 The project required visualising the level of integration between public transport and urban density in these cities. We developed a technique where the rail network is shown as a transect through a 3D population density surface. 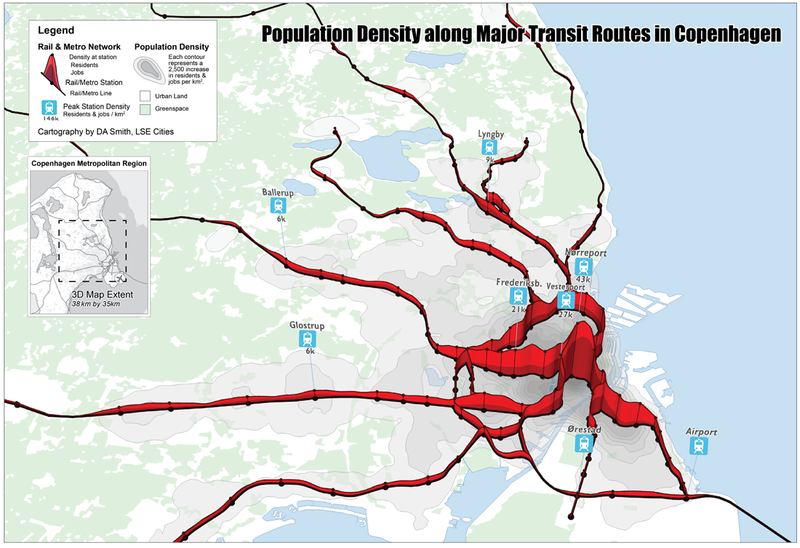 This shows how the density of jobs and residents in these cities is clustered around major public transport nodes. Copenhagen has a classic radial pattern, based on the famous ‘Finger Plan‘ developed over 60 years ago, where linear urban features are separated by thin green wedges. This is quite distinct to the UK greenbelt approach. Current expansion is focussed to the south of the city centre along the Orestad corridor served by the more recently developed metro links. This area sites the airport and transport links to Sweden, continuing the cross-border integration between Copenhagen and Malmö. Hong Kong makes a very interesting comparison. It is on average 8 times(!) higher density than Copenhagen, and peak densities are around four times higher at nearly 150,000 jobs & residents per square kilometre. This is due firstly to the natural boundaries and country park designations that prevent suburban development, and secondly to the unique ‘Rail plus Property’ planning model run by the government and MTR, where extremely high development densities are pursued at rail station sites, and land value gains captured to fund public transport. The result is a polycentric pattern of jagged nodal development. Another way to consider this relationship is to measure typical distances to rail & metro stations for these cities. As can be seen below, Copenhagen and Hong Kong compare favourably to other leading global cities like London and New York. It would be interesting to pursue this analysis further for London. 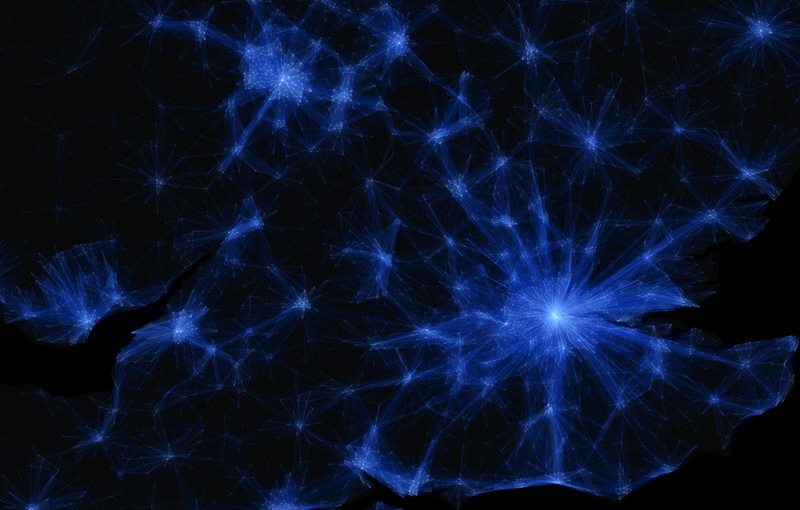 You can see that London scores relatively lower for the population within 500 metres of stations. Intensification policies at public transport nodes are a recent policy change for London. Accessibility figures are likely to change over time with several major intensification projects under way at rail stations in Inner London. (Above figure based on metropolitan regions. Defined as Outer Met Area for London and 100 km by 100 km square centred on Manhattan for NYC). Autonomous car concept by Mike and Maaike. 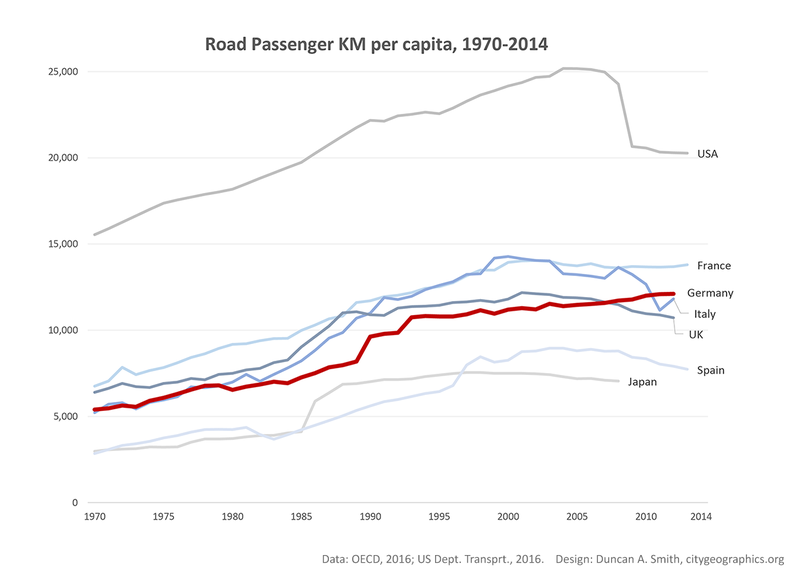 Despite the litany of sins levelled at the automobile- it’s woeful energy efficiency, harmful pollution, congestion, road casualties, damage to public space, contribution to obesity- we are still wedded to the car. In the UK the car accounts for over three quarters of trip miles. The flexibility, security and door-to-door convenience of automobile travel remains a winning combination, particularly when we spent most of the 20th century developing car-based cities with limited alternatives. Current planning practice restricts car travel to improve sustainability and urban quality of life. Short of an outright ban however, the car is here to stay in some form or other. For the automobile to be in any way sustainable we need to radically challenge current systems of car design, driving and ownership to effectively create a new mode of transport. This post considers whether such a revolution is possible in light of exciting recent innovations. We now for the first time have competitive alternatives to the internal combustion engine car on the market with electric and hybrid models from the world’s biggest manufacturers. These technologies dramatically reduce or remove tail-pipe emissions. Surely then the eco-car has now arrived and city transport has been saved? Well… as electric cars (and vans/taxis/buses) become more widespread urban air quality should improve dramatically, as should vehicle mileages. But as we generate the majority of electricity using fossil fuels (and will continue to do so for the next 20 years+), CO2 emissions from electric cars remain significant. 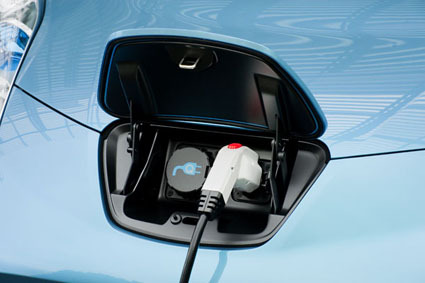 Furthermore several other car design issues are not solved by electrification, such as energy used in manufacture, road congestion, safety and damage to public space. There’s a danger that electric cars become merely a green-wash cover for business as usual, rather than as a step towards bigger change. Most cars are driven for a relatively short period each day, and are parked the rest of the time occupying land (around 10% in cities). On-street parking eats up large amounts of valuable public space from pedestrians, public transport and cyclists. It’s a wasteful situation, both for the efficiency of cities and for the environment due to the vast amounts of materials and energy used to manufacture our largely idle cars. One increasingly popular solution in cities is car-sharing, with the largest company Zipcar now up to 700,000 members. Car-sharing is a convenient and affordable option for many city residents who want regular car access without the hassles of ownership. The popularity of smartphones provides an easy way to manage car-share booking. 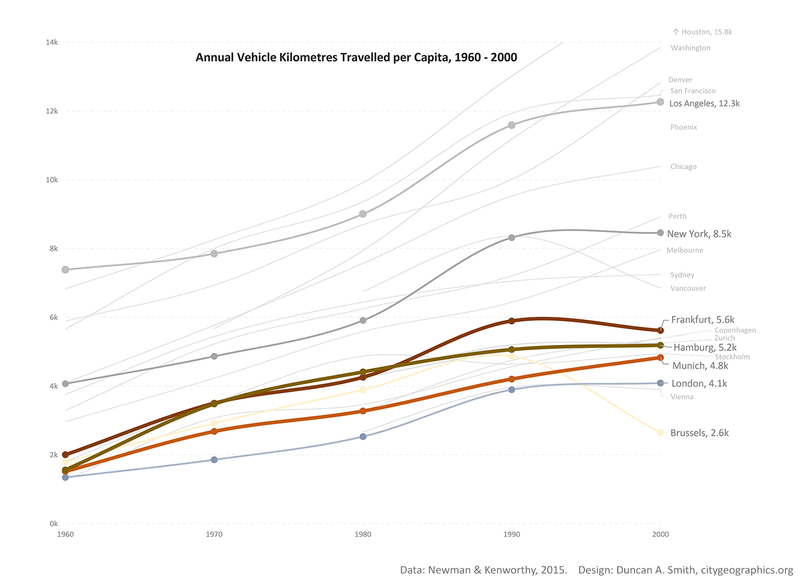 Comparable sharing trends are also evident for ride-sharing and for urban cycling. Is sharing the answer then to the sustainable city travel? It’s definitely an important trend. Sharing allows a much better pricing model for driving, paying by the mile and charging more at peak times, thus encouraging more efficient behaviour. Car-sharing coverage is limited however to denser urban areas, and it is not yet clear to what extent car-sharing can significantly reduce the total number of vehicles and car parking space in cities. The last trend is at a much earlier stage than electrification and car-sharing, yet it could have the most far-reaching consequences. Sat-nav and parking-assist technologies were early steps towards greater automation in cars. 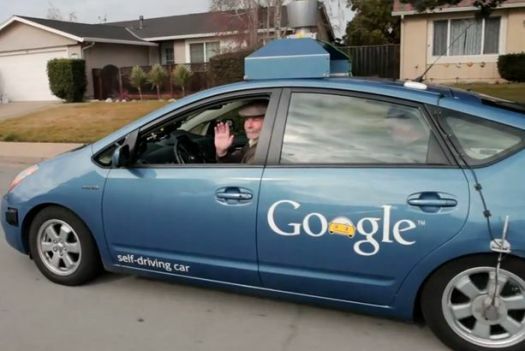 Now Google as well as several manufactures have working prototypes of autonomous or self-driving vehicles. Amazing yes, but what’s the point? In its current form, the application of this technology is not immediately clear, beyond providing a luxury car gizmo that lets you read the paper while your car drives you to work. 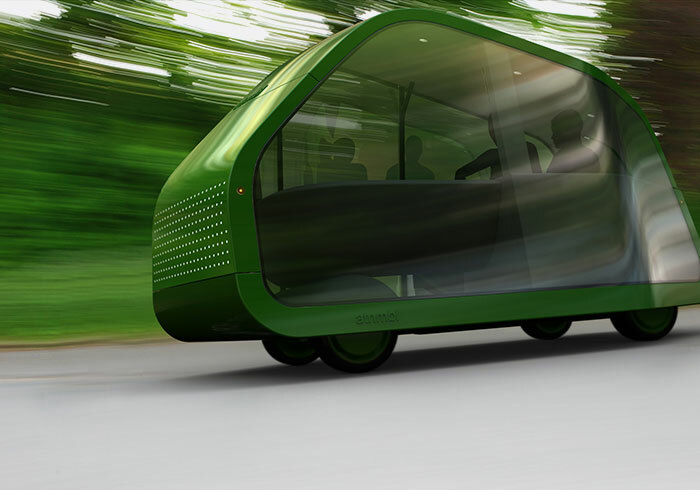 But future developments will likely involve cars built around self-drive from the ground-up. Potentially you could have a city taxi fleet of fully autonomous electric cars, requested by smartphone, operating 24 hours a day, moving to areas of high demand, charging batteries when not in use. Whilst bad news for taxi-drivers, such a system could be highly efficient and provide a quick and flexible complement to mass transit networks. A related concept has already been developed in a rail-pod form operating at Heathrow airport. Dubbed Personal Rapid Transit, it is intended to combine the advantages of both private and public transport. Obviously the challenges of converting such a system to operate autonomously in the ‘wild’ of the urban environment are many, yet are increasingly being tackled. If such a system could safely and legally operate, the implications would be massive. Imagine freight and courier services operating automatically at night to minimise disruption; your car picking up your shopping on its own, or taking a nap and waking up at your destination. It’s easy to get carried away with the wonders of new technology. 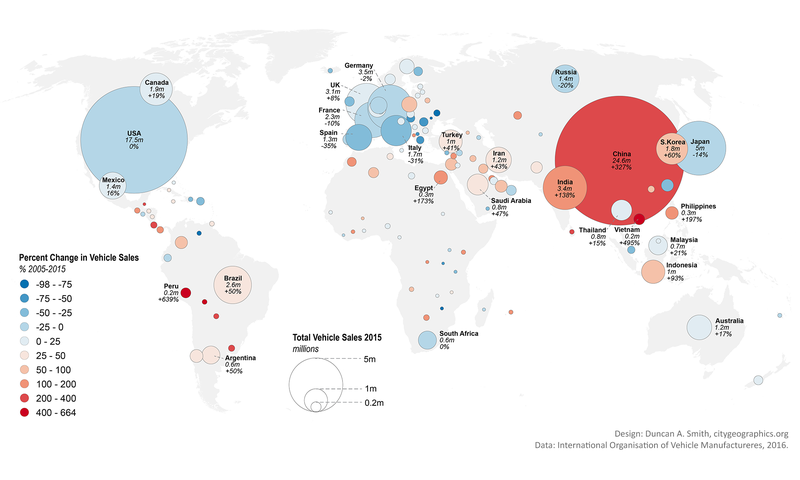 Transport challenges require political and economic solutions as much as technological brilliance. Indeed relying on car manufacturers alone to green transport is as unlikely as “Beyond Petroleum” BP and Shell delivering the renewable energy revolution. Yet there is some incredible innovation currently emerging, and the next couple of decades are certain to be very interesting times for urban transport. There have been some wonderful flow maps appearing online recently, such as Paul Butler’s global facebook friend’s map, and maps of global trade and flight patterns. 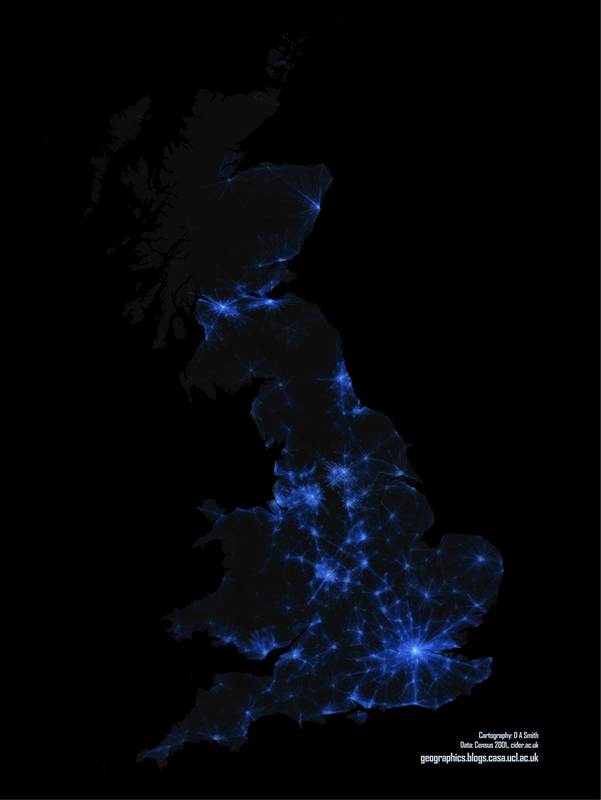 Inspired by these, I’ve been mapping travel patterns in Great Britain using a similar “night-lights” visual style. 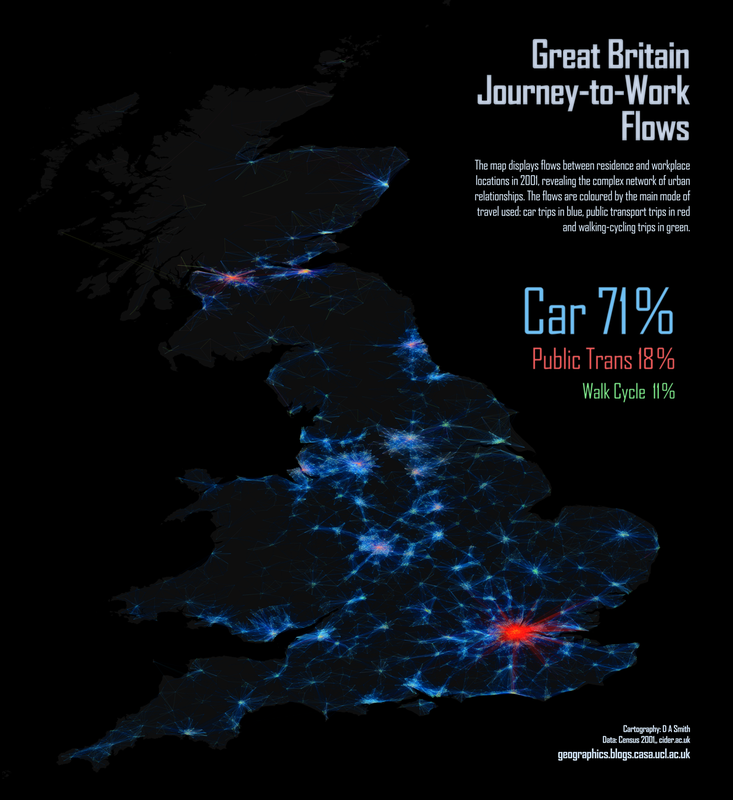 The aim of the visualisation is to put travel patterns in the context of the diverse urban scale and geography of Great Britain, and reveal the degree of regional variation. The map really highlights how different London is in terms of its extensive regional public transport network, with the other major English conurbations like the West Midlands, Manchester and West Yorkshire being highly car dominant in comparison. 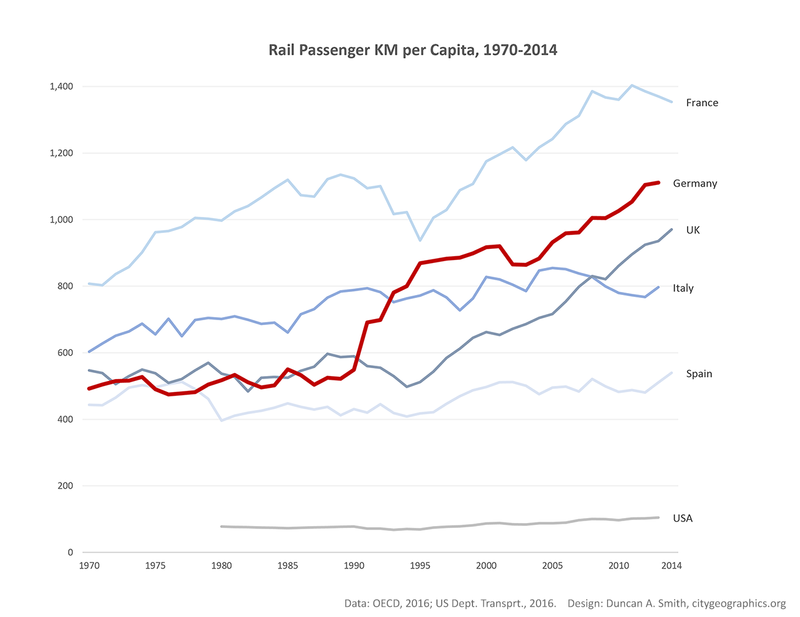 The variation in public transport levels could be argued to relate to London’s massive size, yet the Scottish cities of Glasgow and Edinburgh perform well in public transport terms, despite being smaller than England’s northern cities. Active travel modes of walking and cycling are generally minimal. The cities that do relatively well are the “cathedral cities” like Cambridge and York, with a few surprises like Hull. The maps were created in ArcGIS using the XY to Line tool, then exported to Illustrator. A key aspect of such flow visualisations is that the thousands of overlapping flows add together to form denser links using a cumulative transparency effect. This is much easier to achieve using a vector graphics program such as Illustrator. Would be nice in a future post to add Northern Ireland and the Republic, and will get a data update with the 2011 census next year.